Have a latte before taking in "One Nite at Mongkok." You're going to need it to keep up with this roller-coaster crime noir, which takes you into the ugly depths of one of Hong Kong's most densely populated areas. To outsiders, Mongkok has been known as one of Hong Kong's most popular shopping areas. Director Derek Yee shatters that pleasant idyll easily. Lives are also for sale, cheap, in his screenplay, which takes a grim and cynical view of human nature and justice. The story's impact is all the greater because of its immediacy. The devastating chain of events start "the day before yesterday," "yesterday" and, finally, "today." The film starts like a violent, testosterone-charged free-for-all, but Yee's in control every minute, eventually bringing his story full circle. Amidst the carnage of the first 10 to 15 minutes, it's hard to keep up with who's in which gang. In eye-for-an-eye justice, the death of one gangster's son demands retribution that eventually leads to a hit ordered on crime boss Carl, and this is when the film slows its frenetic pace. 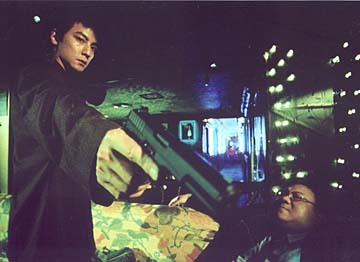 It's the hit man, Lai Fu (Daniel Wu), we're made to care about. Lai Fu is a stoic, bespectacled country bumpkin who needs this job as a matter of survival. The hit is worth a princely $15,000 to him, enough to return to his village in China and marry his sweetheart, Sue, who's gone missing in Mongkok while tending to her grandmother there. 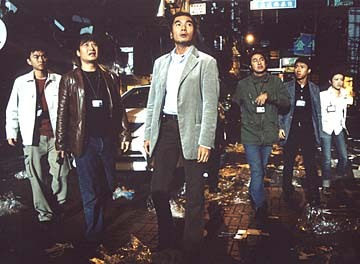 ... and Alex Fong Chung-Sun as Officer Milo, center, aims to stop him. Lai Fu befriends a prostitute, Dan Dan (Cecilia Cheung), who is being threatened by a john, and she attaches herself to her good-looking (when his glasses are broken, she's all for contact lenses), free-spending savior, always keeping an eye on the cache he carries in his backpack. She's also in Mongkok to make her fortune and, for a price, becomes Lai Fu's guide through its labyrinth streets in search of Carl. In the meantime a group of police officers are doing all they can, including giving up a holiday, to stop the hit from taking place. Within their ranks is a trigger-happy recruit named Ben (Anson Leung) who takes pride in his two shooting successes, even while his superior, Officer Milo (Alex Fong Chung-Sun) has never forgiven himself for killing someone. Of course, no happy ending can come from the ultimate convergence of prostitute, gangsters, cops, hit men and other characters flitting through this film. And it turns out that Lai Fu's and Sue's fates have been linked all along. The script could have been tighter, and goes against the Hollywood scriptwriting rule of introducing main characters early, which could alienate an American audience. Chinese audiences have also criticized the sophisticated accents of the actors playing rubes from China. But those are minor points in the otherwise tense and riveting drama that earned Yee well-deserved best director and best screenplay awards at the 24th Hong Kong Film Awards.